My cousin is a Hello Kitty fan of note and asked me to make this cake for her little girls 2nd birthday party. I made two vanilla sponge cakes, one in round pan and one in an oblong pan. I put them together on a cake board and carved out the Hello Kitty shape. I dirty iced the cake with vanilla butter cream then covered the whole cake with white fondant. I made the eyes, nose, whiskers and music notes with black fondant. I rolled out a square piece of purple colored fondant and used a knife to cut out the electric guitar shape. 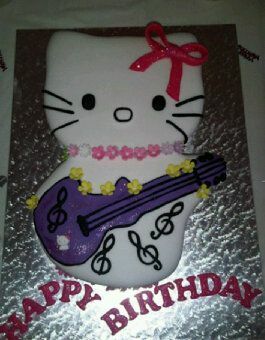 I then laid the guitar in the correct place and decorated it with the strings, etc using black fondant. The bow is made from electric pink colored fondant which I dipped in pink sparkle. I finished her off with a daisy necklace and the electric pink Happy Birthday. It made me happy to see how excited my cousin and her daughter was when they saw their cake!